It’s hard to believe that Google’s search engine was in its infancy ten years ago. Suffice it to say, it’s changed the way we find information. If you are like most people, you probably use Google many times a day and can hardly imagine a world without it. Unless you are a technology geek (or a private investigator), you probably use Google in its simplest form. However, you can’t always rely on basic queries to find the information you are looking for. The following is a list of tips we have found helpful over the years in the course of many Google searches. This list is by no means comprehensive, but these are search queries that we use almost every day. Let’s say you are trying to find information about a John Doe, but there is another John Doe who happens to be a well-known professional baseball player. You can omit results that include references to baseball by simply using the “-” symbol in front of the word you want to exclude. Google has an undocumented operator (it’s a secret…shhhhh) called “AROUND,” which will search for terms that appear within a specified number of words of each other. It’s especially handy when searching for a combination of terms where one term dominates the results, but what you are really interested in is the relationship between the two terms. For example, if you wanted to know more about the relationship between Bernard Madoff and Frank DiPascali, Madoff’s top lieutenant, you could use the AROUND feature to focus your research. Example Search: “bernard madoff” AROUND(5) “frank dipascali” [AROUND must be capitalized; the “(5)” represents the number of words separating the two terms]. The link operator is not something that gets used often, but for an investigator, it can be critical in identifying, for example, who is behind a website. If you wanted to see who was linking to Diligentia Group, for example, you can find articles, comments and social profiles linked to our site that could show a direct relationship between the website and the people who are behind it. 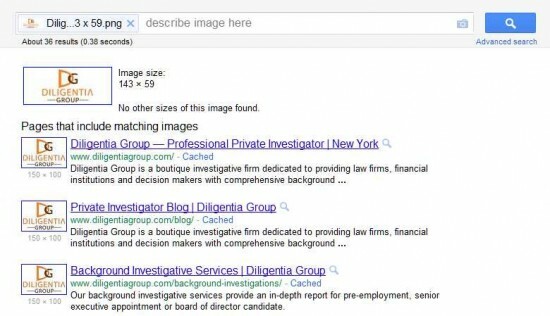 Google recently launched a new feature called Search by Image. You can either upload an image or paste an image URL into Google Images and it will find identical images and visually similar images. While it’s still in its infancy, there are lot scenarios where this can be helpful for a private investigator. For example, you may want to identify trademarks, copyrighted images or a picture that may have been improperly used on the web. Your turn. What’s your favorite Google search technique? Tell us about it in the comments. Good tips! The Google image search is a new one to me.